In this image from a year ago, an ATS bus makes its way up Washington Street near Second. Should the Albany Transit System raise its fares? The city council on Wednesday put off a decision. And common sense argues against it. On the council’s agenda was a resolution to raise bus fares from $1 to $1.50 for adults and from 50 cents to 75 cents for youth and for folks who are disabled or old. The council held a public hearing, and no one rose to say a word. “Please consider the reasons people in Albany ride the bus. I think it’s mostly because they can’t afford a car or are too old or disabled to ride a bike, let alone drive. Fifty cents more to ride the bus likely means that if they can, they’ll walk instead. Or not make the trip at all. Or in some cases, heaving to earn the money first, by finding and then walking to redeem five more discarded cans. By now I would have run out of breath, probably. The city staff also pointed out that a new state program makes money available for local bus systems that take pains to assure that the poor have easy access. In view of which, the staff memo to the council said, it would make sense to forgo any increase at all. Albany transit is not commuter friendly. Just look at Corvallis transit, more than 2 routes, less than an hour wait for most routes, runs 6 days a week and is FREE to use. Public transportation should be easy to use by the public. Not take 2 hours because you have to wait for only 2 bus routes in town, when it would have only taken 30 minutes to walk. Sorry Hasso, but a 25 and 50 cent hike is still cheaper than owning a car. The backwards-looking populace of Our Fair Cityhave determined that the current level of support for bus service is adequate. Obviously, that estimate is wrong. A look in their rear view mirror tells the vast majority of Albany taxpayers that once-an-hour bus service is all they are willing to pay for. The thinking seems toq: I make my way around. The rest of you should do the same. The City of Corvallis made a different decision. Looking forward, the people of that community thought it wise to have free buses, with more service and more routes. The citizens of Corvallis saw an opportunity to decrease traffic and to make accessibility a prime consideration. The people of Corvallis view mass transit as an important community asset, not a joke. The question is, what is the difference between the thoughtful, forward-thinking citizens of Corvallis and the reactionary, backwards-thinking citizenry of Albany? The two cities are close geographically. But the two communities might as well be on separate planets. Attitudes related to mass transit support make that distinction utterly clear. Albany’s residents should be less concerned with a fare increase. Instead, they might consider examining the crude underpinnings of their moral and social codes. We own two rental houses in Corvallis that we purchased in part because they are on a bus line that is a straight shot onto campus. Over the years the tenants either ride their bikes or drive up to campus. You can lead a horse to stables near the bus stop but you cannot make them board the bus. What is wrong with Albany is its Republican, conservative viewpoint. Corvallis is progressive. Corvallis free buses aren’t exactly ‘free’…somebody is paying for them. Own property in Corvallis…part of your property tax pays for the bus. Pay for water…you’ll note that in additional to service and actual water, you’re all paying Sustainability Initiatives Fees. Even if you are renting, you’re still paying because your landlord has to cover his/her costs. OSU, HP and Samaritan contribute huge sums…while some of those contributions are written off, some of them are recovered through increased prices. This is really so simple. If you want less use of something having a limited supply, and a very high cost to increase the supply, you increase the price. Examples: parking, highway, and electricity use at peak times. On the other hand, the bus system is almost the opposite of this. The supply (at its likely rate of use) is practically unlimited, even if it was free. As more people ride the bus, the pressure on scarce resources related to driving is reduced. This is the difference between Republican and Democrat thinking. Albany has a bus the costs the same to run, but want a token payment from riders because to them, nothing should be free, Corvallis has a very successful bus system, free to use. People use it. Albany Republicans could show their worth as human beings if only one single wealthy person donated $30000 to cover all bus fairs and make ridership free. Trust me, they are wealthy because of greed, nobody in Albany would even think of such a thing. Not even in their last will and testament would they donate $30,000 to this cause. Albany is sad that way. The 10th commandment states thou shalt not covet thy neighbor’s goods. Do you use the Albany library building which was donated. I get tired of everybody always talking about greedy rich people which seems to be the prevailing thought for all you liberals. Who do you think pays for the bus system? Welfare recipients! The Corvallis bus system was successful before the city made it free for everyone. It is not successful as a result of the free system. You’re spot on Hasso! The bus service in Albany should be FREE. It’s such a minor expense in a city this size. No one chooses to ride the bus, unless they have no other choice. 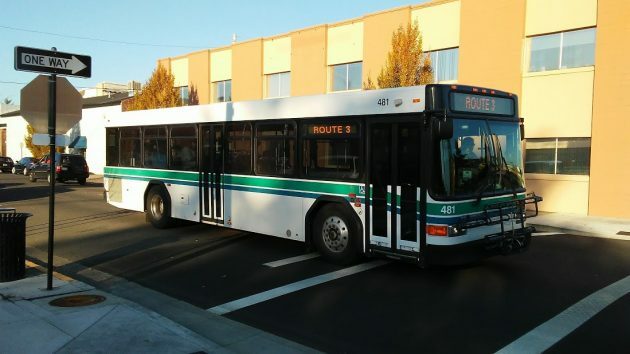 “Funding for CTS comes from a number of sources: State grants, Federal grants, Oregon State University, miscellaneous sources like advertising and donations, and since becoming fareless in February 2011, from the Transit Operations Fee (TOF). I too want to draw the comparison to Corvallis public transportation. My understanding is that Corvallis accessed grant monies to invest into buses and offer fare-less rides. Has Albany pursued the same monies? Another thing about CTS – there is significant advertising done on these buses. Why doesn’t ATS make buses a source of ad revenue? The purpose of public transit is accessibility for all or vast majority of people, usability, and as a means to reduce traffic. Albany ought to be investing in this and encouraging inward residential growth instead of sprawl. Transportation dept. needs to work with city planners to encourage smart growth and development. Hey – Nothing is “free” someone has to pay the costs for equipment, fuel, up keep, labor, etc. It comes out of your pocket no matter what you are told. As Mr. Kapaun said (above) it comes from utility fees in Corvallis – everyone pays!!!!!!!!!!!!!!!!!!!!!!!! Bill is correct. If anyone here believes the Corvallis system is “free,” I have a bridge i want to sell you! The people of Albany understand that the citizens of Corvallis are more inclined to help those who need it, more likely to treat all of the community as valued. Hence, the people of Corvallis voluntarily placed a tax on themselves for the express purpose of underwriting transit operations. Unfortunately, the lesson Corvallis teaches has failed to reach denizens of Albany. Instead of Transit, Albany subsidizes the downtown business core. Let’s be honest…Corvallis has the resources for “free” bus service because every kid that attends that college leaves $50,000 to $100,000 of their future income behind. Albany busses are the least successful City enterprise, They should be free or better eliminated and we should subsidize taxi service to get people where they want to go when they want to go. Those big diesels spew fumes with only 1-3 people usually on them , if any. Not a bad idea, vouchers for low income Uber rides. Creates private sector jobs and kick starts the free market. Your schedule may be valid in spirit, but it doesn’t correspond to any actual route in Corvallis (unless I screwed-up badly). Mostly it’s hourly service all day, with routes 5 and 6 half-hourly and even better at times, and some additional peak-time-only routes. Also, the weekend Night Owls when OSU is in session (my favorite for grocery shopping). I just discovered that all 8 regular routes now run on Sunday, 9 to 5-ish. 1 – As I said above for the Albany example, the difference between 94% and 100% government financing just isn’t worth bothering about. Don’t forget, it costs money just to collect, handle, and deposit the measly $28,000 cash. 2 – It’s good that, as individuals and families, we can choose to live in a high-maintenance city like Corvallis, or medium-maintenance like Albany. Not sure where for low-maintenance – maybe unincorporated Douglas and Josephine Counties (not meant as disparagement, I’m aware of the issues they face). 3 – Everything should not be “free,” only those things which make good economic sense, where the incentives are beneficial to society as a whole – congested-area driving, no; bus rides in smaller cities, yes. All the socialists want free stuff–let someone else pay. Our education system is so flawed un-educated folks continue to think everything should be free. I see bus riders with ever present cell phones in hand and cig smokers hanging around the old armory on Lyons. Lack of money is not a valid excuse for subsidies. Every rider should be required to ante-up more to cover costs. Seems that the Albany bus system is a minimalist answer that is designed to fail. Hourly service limits ridership as do the limited hours of service. If this is an important service that needs a ridership increase, expand the service rate and hours. Having said that, I see many pedestrians and bicyclists toting groceries and other freight. Don’t know if those souls chose a healthy transport method, or if the method is what they can afford. Just one example: Living carless (not thru financial necessity) in Corvallis, close to a bus line which directly and quickly goes to half of my stores, I usually go by bicycle unless there’s a really good reason to take the bus. Maybe it’s the health thing, and a need to maintain sturdiness and self-reliance at age 73. Maybe I can’t deal with schedules, and don’t really like riding buses. The only prospect worse than relying on buses would be owning a car – I would rot physically and become a hypocrit. Right on about “minimalist answer that is designed to fail.” Maybe subsidized taxi/Uber/Lyft/etc. suggested above is a better idea. Whatever it takes to make car ownership rare, safe, and voluntary.